Born in Upper Ferntree Gully in Victoria, I was the youngest in a family of 4 kids. We moved to chilly Cooma when I was a toddler – dad worked for the new Snowy Mountains Hydroelectric Scheme. One of my earliest childhood memories is sitting on Dad’s knee by the fireside while he sang "Old Black Billy" and "Reedy River." The family sang silly songs in the old 47 Chevvy as we headed on holidays down to Bermagui, out to Lake Eucumbene or fishing on the Murrumbidgee. My older brothers and sisters always sang off key - as did mum… - I used to plead with them to stop! I doodled on pianos in friends homes and at the CWA holiday house in Bermagui - we had no musical instruments at home. I loved Peter, Paul and Mary (PPM) records, as well as William Clauson, Gary Shearston, Leonard Teale and Nina and Frederick on ABC. My earnest singing at school led to parts in school musicals - I envied the kids who had piano lessons. At age 11, when visiting big brother Fred and sister Karolyn at Uni, one of their friends showed me a guitar and how to play Little Brown Jug. I was rapt! My siblings clubbed together to buy me my first guitar and I started lessons, fingerpicking 500 miles, A-Soaling, then progressing to classical guitar. I treasured my Pete Seeger songbook. In my first year at High school I started playing flute as well as guitar - from age 15 attended summer schools with Spanish guitarist Antonio Losada and flute lessons with Margaret Crawford at Canberra School of Music. After finishing school I moved to Sydney to study Science at UNSW, where I heard folk artists including Declan Affley, Gary Shearston, Mike McClelland, Marion Henderson, Margret RoadKnight. Paul Stookey once played at the University Roundhouse. I loved Leonard Cohen and learned to play his songs along with those of Joni Mitchell and Janis Joplin. After graduating, I taught music for a short while, then worked in Asia with my Uncle Bill Watson who produced British dinner theatre in Hilton Hotels. On my return to Sydney I volunteered 20 hours a week at community radio station 2SER FM as an announcer/producer, mentoring kids and presenting Arts on Sunday. The station featured original music, challenged many social norms and represented many minorities. I also wrote guitar/flute music for experimental theatre productions at UNSW and the Seymour Centre, while completing a Grad Dip in Communications. I moved from Sydney to the Redlands in the mid 80’s to be closer to family and joined two community orchestras: Cleveland Symphony orchestra and St Lucia orchestra as a flautist. In 1998 I met Colin Nightingale and Patrick Burke. I was invited to join the Celtic/covers band "Late Edition." This band evolved into "Thornlands" in 2000 with Patrick Burke, Julie Minto, Lee Nelson and Paul Smith. "Thornlands" recorded 2 CDs, "Live at the Soundshed" and "In the Park,’ performing at many festivals and events including Woodford, Wintermoon, Redfest, Cygnet, Georgetown, Dorrigo, Neurum Creek, Yeppoon. In 2005, Colin Nightingale, Patrick Purke, Christine Burke, Terry Annesley, Harry McKenzie and I formed Folk Redlands which has been going now for 12 years at Redlands Indigiscapes with twice-monthly free music events and a major Music Festival every year. In 2008, I studied a range of singing styles with Brisbane-based teacher Sarah Collyer which, helped me learn more about, and trust my own voice. Theatre director Terry Annesley invited me to be Music Director for the Theatre Genesis production of Reedy River – I have since worked as Music Director/performer for a number of theatre productions in the Redlands. In 2011, I met Dr Christina Henri – visual artist, historian and academic who pioneered the ambitious international "Roses from the Heart" project. This project celebrates the stories of the 26,500 women convicts who were transported to Australia in the 18th and 19th centuries. Dr Henri invited me to perform 2 convict women songs I had written: "Eliza’s Lament," an unaccompanied traditional song and a ballad, "Ten Yards of Muslin", at her major public arts event in Hobart in 2013. It was broadcast live on ABC radio - there was a surreal moment as the Lord Mayor of Hobart, Alderman Sue Hickey in her full ceremonial outfit held the microphone for me to sing/play on Constitution Dock in front of the assembled crowd! "Ten Yards of Muslin" is a tribute song I wrote for my own convict ancestor Catherine Clark – who was transported with three other girls for stealing ten yards of muslin. Colleen McCullough’s historical novel "Morgan’s Run" includes her story as Richard Morgan’s common-law wife on Norfolk Island before they settled in Hobart town. In 2012, I wrote "A Billyfull of Silly Songs" - fun children’s songs for voice and guitar, based on Aussie bush creatures and ran a singing/puppetry workshop for kids at the National Folk Festival. In 2015 Julie Minto, Trish Rodwell, Cath McCourt and I formed the band "Mama Juju and the Jam Tarts". Our first original CD "Titbits"was recorded/engineered by Dave Parnell (Mashpro) and released in September 2015. The band’s music slides freely from folk/celtic to jazz/swing and rock with original songs and covers. We have performed widely at festivals and events including Neurum Creek, Coast Acoustics, Redfest, Tropulele International Women’s Day, Folk Redlands and the BUG. I recently had the honour of playing flute at Wintermoon Music festival’s closing ceremony with tribal elders Uncle Kenny Peters-Dodd, Reinhard Ngathne King Gmeinder and the Birri (River) people. I am actively involved with Folk Redlands, as well as writing and performing solo and with Mama Juju and the Jam Tarts. Our new CD "Ukulele Mama" has just been released, with new line-up Julie Minto, Vicky Macdonald, Trish Rodwell, Connie di Dato and Jodi Murtha. I am lucky to have so many musical influences- when song-writing, I find ideas often burst full-blown into my mind, and can be any genre - traditional, country, ballad, swing/jazz, blues, music theatre, silly kids songs, quirky! 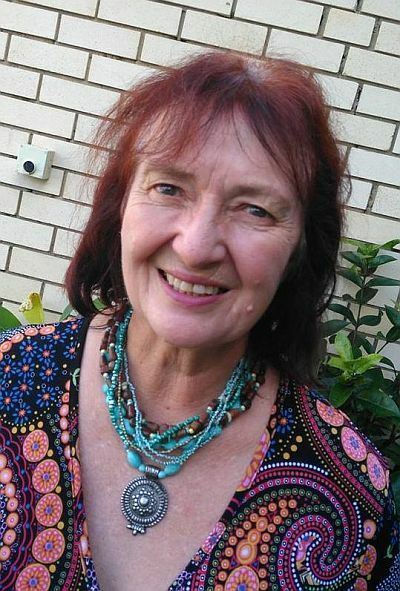 My new alter-ego, children’s character "Granny Gumnut" is also bursting out and will be sharing a little musical magic and fun with kids at upcoming festivals. I look forward to recording a solo CD - I have a number of songs waiting in the wings. I am deeply grateful for the fellowship, encouragement and peer support I have received from my friends in the wider Brisbane Folk and Music scene and looking forward to more…..thankyou to all!